When friends and neighbors learned that little Sammy Sommer was losing his battle with cancer, they rallied around his family and created an organization to help grant wishes for the terminally ill 8-year-old and his loved ones. The first wish the group — dubbed "One Wish, Two Wish, Red Wish, Blue Wish" — attempted to grant was a big one: Sammy had said he wanted fireworks at his funeral. In less than a week, at the end of December, the group, with the help of others, found a way to put together a professional fireworks display at a local golf course for Sammy and his family watching. "Fireworks lit up the sky last night," his mother, Phyllis Sommer, wrote on the blog where she's been chronicling her son's condition. "Sam was physically uncomfortable and feeling fragile, even though he was only surrounded by his inncer circle. But the lights lit up the sky and he watched..transfixed. For a few moments transported away. And for the rest of us? They lit up our souls. I will never see fireworks again without thinking of this night, when our community came together to illuminate the love for a little boy and his family... thank you." At the center of this community outpouring is Sammy “Superman” Sommer, a high spirited, smart, funny kid who likes dinosaurs and bugs — anything with a lot of moving parts. He has a mischievous side, often pointing toward nonexistent bugs to scare his mom, who really doesn’t like them. That sense of humor often seems well beyond his years. No one knows whether it’s because of all the time he’s spent around adults since his cancer diagnosis, or if it's maybe just the way he was wired right from the start. Sammy had been leading the life of a typical American boy until the summer of 2012, when he started feeling a strange pain in his legs. Doctors soon diagnosed acute myeloid leukemia and started treatment, which put his cancer in remission. But that lasted only a few months. Soon, his cancer was back with a vengeance. A bone marrow transplant in the summer of 2013 seemed to be helping, but that too failed, leaving the Sommer family to grapple with the realization that they were going to eventually lose their beloved boy. That’s where the wish fulfillment group came in. While they couldn’t cure Sammy’s cancer, they could try to make him happier and make the day-to-day aspects of life easier for his family. When it became clear that Sammy’s mom and dad didn’t have time to shop for winter clothing for his sister and two brothers, a volunteer shopped for them. When no one had time to take Sammy’s sister to ice-skating lessons, someone else stepped in. When Sammy’s older brother wanted to go to circus camp, yet another volunteer showed up. And while "One Wish, Two Wish" was founded to raise money to grant Sommer family wishes, it has quickly grown into a second mission: raising public awareness about pediatric cancer, so that others might be saved from going through what this family has. 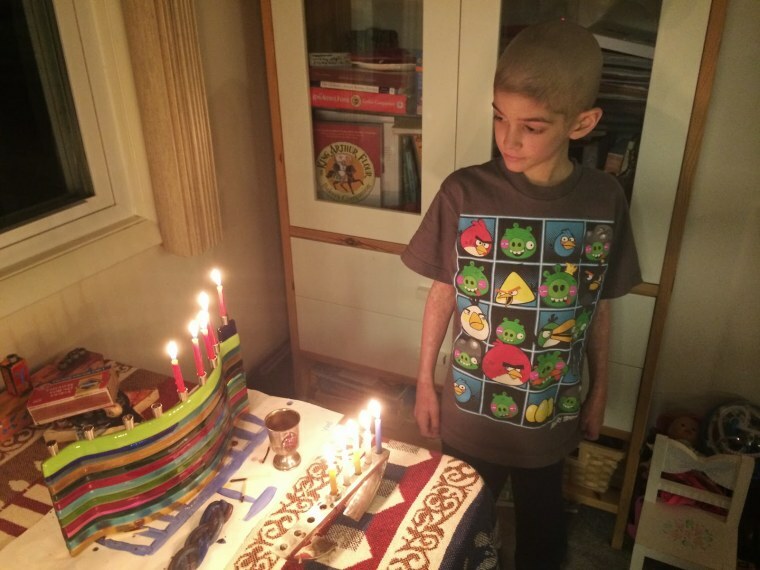 These days, Sam’s parents, who are both rabbis, are trying to look beyond the immediate wrenching pain of watching their little boy get sicker with each passing day. Learn more on how you can help the efforts for Sam and others with pediatric cancer here.